The Spotted Drum or Equetus punctatus is a saltwater fish that has quite the transformation as it grows older. When this fish is a juvenile they have a long dorsal fin and tail that changes as the fish thickens up, and developes spots on their tail and 2nd dorsal fin. Pictured below is a juvenile Spotted Drum, you can really appreciate the amazing transformation this fish undergoes by comparing the two pictures. 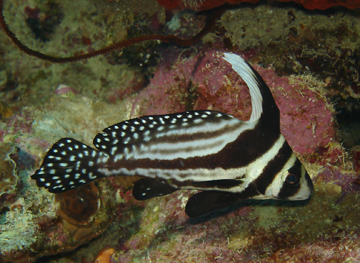 Spotted Drum fish occasionally make their way into the aquarium trade and are said to be a great addition to a reef tank. They are healthy eaters and will also hold their own against other potentially aggressive tankmates. These fish can grow to about 10" in length and are found in the Western Atlantic Oceans tropical waters, in and around reefs. They are nocturnal feeders who hide most of the day and come out to feast during the night hours. You can watch a Spotted Drum swimming in the video below. 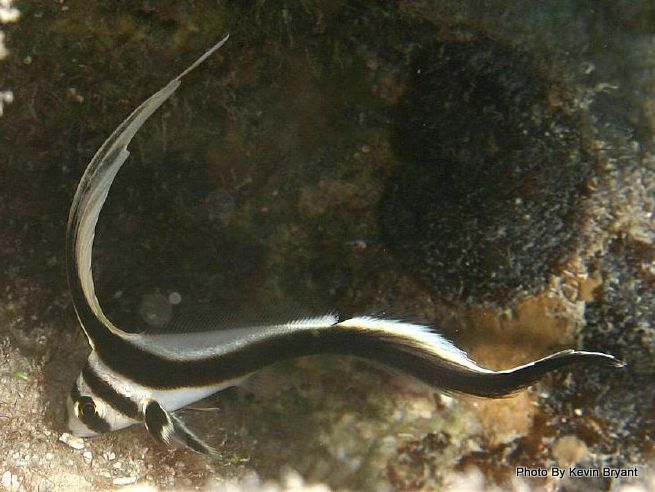 If you have any additional information about the Spotted Drum including tips for keeping them in an aquarium please share in the comments below.